WOW!! This 68 Road Runner is Absolutely Awesome!! ALL MATCHING NUMBERS!! This is a Frame Off Restoration that comes with the 383 CI High Performance Big Block bored .030 over, Mild Cam, Pro-Form Electronic Distributor, Factory 4 Speed with New Brute Clutch, All New Emergency Brake Cables, All New Brake Lines, All New Fuel Lines, KYB Gas Shocks, Updated Wiring Harness, Vintage Air, New Wiring, New Stamped Clear Glass, New Power Front Disc Brakes, New Rear Brake Assembly and Drums, New Dual Exhaust, New Flowtech Headers with Summit 2 Chamber Mufflers, 8 3/4" Rear End, 3.23 Gears, New Headliner, New Carpet, New Vinyl Seating, New 17" Retro Wheels, New Nitto Extreme Performance NT 450 Tires and so much more!!! We are located in Clinton, MO, less than an hour southeast of Kansas City!! 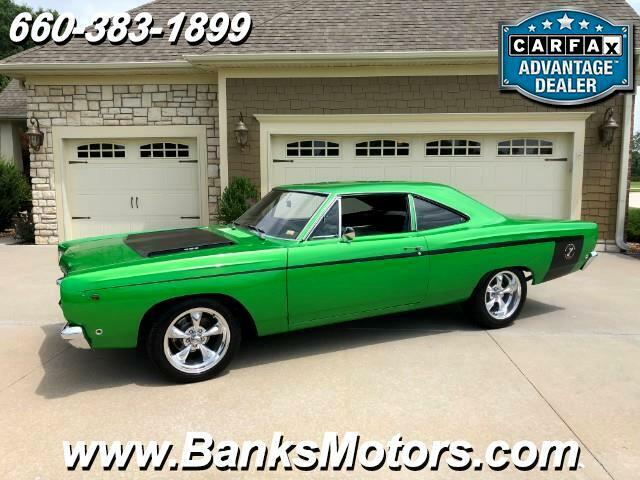 Message: Thought you might be interested in this 1968 Plymouth Roadrunner.